Edward lived with two other Wires and was much loved by Mike. 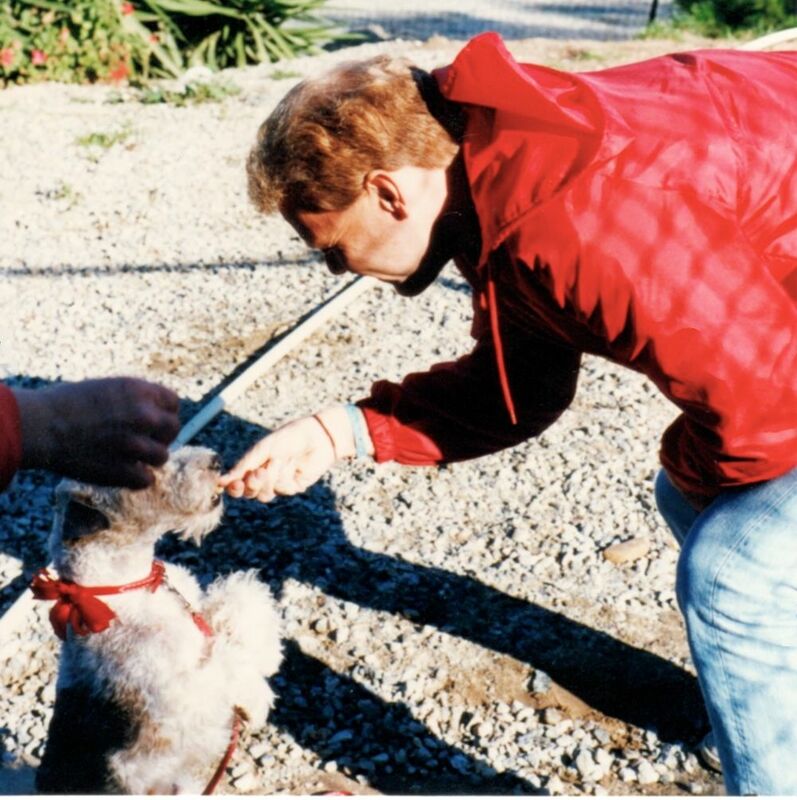 Many years ago, in 1988, Mike suffered a serious accident and his family, assuming his death was imminent, gave away all three of Mike’s beloved Wires. Mike miraculously recovered and set on a quest to find his dogs. He found two, but not Edward. The only information he had was that Edward was given to a man in Lancaster, California. Time passed. Christmas eve arrived and Mike was despondent over not finding Edward. Back in those days, the best publicity for a rescue was an ad in the paper. We had a small, three line ad in the Classified section of the L.A. Times. Even though it was Christmas Eve, Mike called. Months earlier, we told Mike, we had rescued a dog from the Lancaster shelter. But on Christmas Eve, the very day Mike called, the dog was adopted. There was no way to know if it was Edward, and if it was……? Christmas morning dawned and there was another phone call. This time it was from the adopters. Tearfully, they said, it just was not working out. They needed to return their newly adopted Wire. Yes, it miraculously turned out to be Edward! Mike and Edward had a joyous Christmas reunion and remained together for five more years of mutual love and devotion. 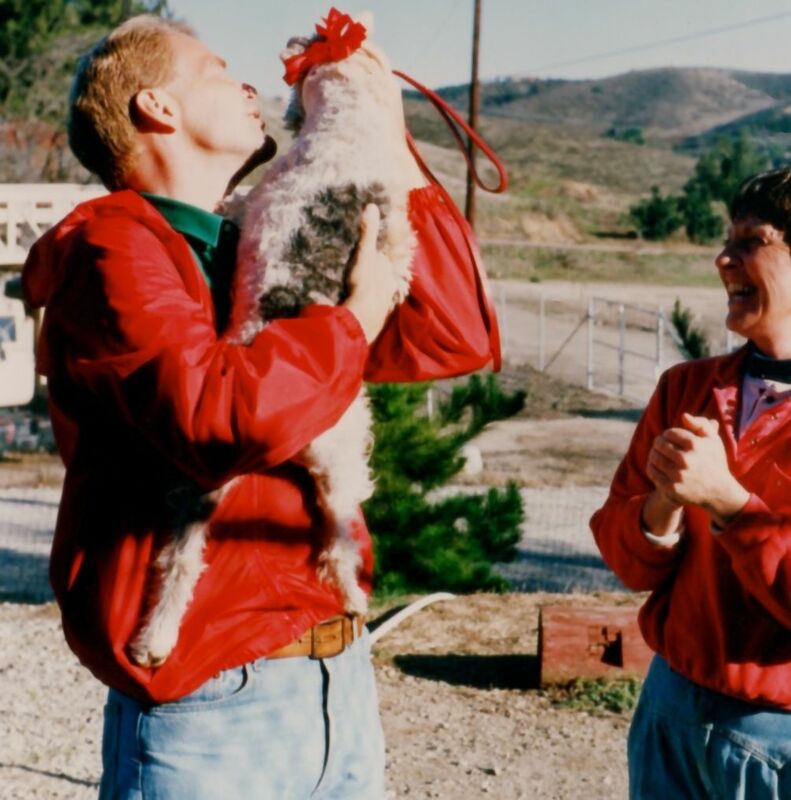 Mike reunites with Edward at the Rescue as a delighted Ruth looks on. NOTE FROM ATRA: Please make arrangements for your dog(s)’ well being in the event of something happening to you as it did to Mike. Make sure family and friends know your wishes–memorialize it in a will, a trust or write it down anywhere it can be easily found in case you are incapacitated. Find someone you trust implicitly to look out for your dog(s)’ best interests. Leaving money to take care of your dog is no guarantee that your wishes will be honored, unless it is to someone you absolutely trust.